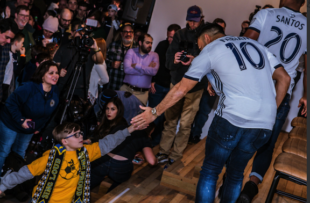 Philadelphia Union’s signing of Marco Fabián is a game-changer. Their signing of the Mexican international No. 10 is about as close to the best case scenario that any knowledgable Union fan could realistically expect. To steal a cliched bit of typical MLS jargon, it checks all the boxes. Let’s look at what’s inside those boxes. When healthy, Fabián is an ideal replacement for Borek Dockal at the central attacking midfielder position. This was the Union’s primary roster gap, and they just filled it with a player who, if healthy, is still in his prime. PSP covered this last week, so rather than restate it, just read it here. The Union appear to have negotiated an exactly appropriate deal for a high-risk, high-reward player. After all, Fabián may say he’s healthy, but he hasn’t played extensive minutes since back problems sidelined him in 2017. No transfer fee. The Union paid no transfer fee, as Fabián’s contract was due to expire this summer. One-year deal, with options. It’s a one-year test drive. If Fabián proves unhealthy, then the Union cut ties at season’s end and start over in their No. 10 search. If he’s good, then they retain him. Appropriate salary. His salary will be over $2 million per year, the highest in Union history. And it should be, for both on-field and off-field reasons. When healthy, Fabián is legit. Hit the soccer fields around Norristown, Bridgeton, N.J., the Atlantic City area and elsewhere, and you’ll find Mexican immigrants everywhere. In some adult leagues and many pickup games, the most spoken language is Spanish. If you pick almost any week in the U.S., you’ll find three of the five most-watched matches are Mexican league matches. The Union have never adequately tapped into the potential fan base of Mexican soccer fans in the region. We can talk about “Latino” fans all we want, but I’m talking specifically “Mexican” and Mexican-American. In fact, only one Mexican player has ever played for the Union: Christhian Hernandez, who moved to New Jersey while still a minor, appeared in two games for a total of 26 minutes. (The Farfán twins and Michael Orozco Fiscal are of Mexican heritage but are Americans born and raised in California.) That’s it. Fabián will be the first Mexican international employed by the Union, and no fringe international at that, but rather one of the biggest names for the Mexican national team over the last decade. He has a chance to energize an untapped potential fan base for a team that could use the boost. The Fabiån deal helps explain the Keegan Rosenberry deal, in a way. The allocation money that trade brought will likely go toward paying down David Accam’s salary budget hit so that he is not a designated player. The Union historically do not employ the maximum of three designated players. Under MLS roster rules, a club must pay the league $150,000 for a third slot, unless the player is signed as a Young Designated Player. It’s still not a good trade, but things look a whole lot better than they did six weeks ago. The Union have 26 players on the roster, well short of the league maximum of 30. This leaves room for additions, but it also leaves them lacking depth in key areas. Too many strikers? Fafa Picault and David Accam are now second strikers. C.J. Sapong, Cory Burke and Kacper Przybylko are target forwards. Newly signed Sergio Santos fits one of those slots, but we’ll have to wait and see which. That’s a great depth chart, but also a lot of talent on the bench. Not enough central midfielders. If the Union are playing a diamond midfield, then you’re likely looking at Alejandro Bedoya, Haris Medunjanin and Derrick Jones starting. Warren Creavalle is the backup No. 6, Brendan Aaronsen is the backup No. 10, but who are the backup shuttlers (the flanks of the diamond)? Anthony Fontana and … Anthony Fontana. And where does Ilsinho fit? They need another center midfielder or two. No 3-5-2? If the 3-5-2 is to be a regular formation, they probably need another center back. This roster still looks on paper like it belongs to a 3-5-2 team. Forget the big names. A back three of Auston Trusty – Jack Elliot – Mark McKenzie could fit each player perfectly and be the team’s foundation for years. Whither Picault? He needs to be on the field somewhere. He’s too good, too intense not to. He earned it. And by the way, he plays enough defense that he could be a wingback. Not advocating it, but just saying. This is the thing that has struck me the most since his signing: the team doesn’t seem to have enough players, while simultaneously having too many at forward. Gonna have to make another move or two. It’s a good acquisition but would’ve been better a few weeks ago. Having a final roster before preseason camp is something this organization will never accomplish. The Latino community is already super engaged with Fabain on twitter. It’s great. Desperately hping it translates to butts-in-seats. Good point on our sudden wealth of strikers. … You would think Tanner might be looking at ways to deal Burke, Sappong and Picault within the league to find some better quality depth in midfield. I would think Accam is unsellable because of injury, Przybylko is unproven inthe league and Santos was clearly brought here to play here. There have to be some MLS teams looking for striker depth. Wouldn’t be surprised if we see one or even two more deals before the current window closes. Fafa’s speed fits the [speed] system and he has that 1v1 instinct. Sapong and Burke are known big-body entities. Of the three I’d be most unhappy losing Fafa. I’d gladly lose Acccam but as you note, no one wants him. In re Dan’s good question about central midfield depth, for what it’s worth at the Bethlehem Steel scrimmage Sunday against FC Motown of NPSL, Michee Ngalina was absent. Also of note in re; dan’s Point about three center backs, Ben Ofeimu was present rather than with the first team. Given the wingback role and the possibility of one being caught upfield by a counterattack, three backs defending five attackers is something a four man back line needs to practice. I think when the fullbacks push up we will see Haris drop back into a de facto back 3 with the other two CB’s. So at times it will look like a back 3 but we won’t be using 3 cb’s as our base formation. One possible negative is whether he will be another missing body during the Gold Cup. If the Union don’t have depth, that could be an issue come July, especially if Trusty and/or McKenzie are called up along with Blake, Burke, and Fabian. This to me is when Aaronson will get a good portion of his playing time this year. Thus it doesn’t worry me a bit and rather excites me. Although we have a lot of strikers, didn’t Ernst say that players who don’t make the 18 will play for the Steel this year? That would be rational, and a completely fascinating character study for some of these first-team guys. Will make the battles at practice have a bit more on the line. Factor in that they have talked about having 2 10s on the field in some situations and you could see Ilsinho/Aaronson and Fabian on the field at the same time. I also think that Creavalle and Jones can both play #6 or #8 and also Elliot could slot into the #6 spot as well. Honestly I’d rather roll with our depth being our young guys than older players. I want to be excited, and I am optimistic, but Fabian’s inability to get back into the lineup for Frankfurt is worth noting. I’m hoping it was just a coaching preference and not a reflection of his fitness. Back surgeries are no joke. Personally, Fafa is my #1 on the team sheet. He can be really dangerous in a 2 striker set running in behind to balls from a deep-lying playmaker – you need that to unbalance a 4-man back line. Only concern in our group of forwards is if anyone has the craft/deception to be able to play off of Fabian. Ilsinho certainly can do it, but it is difficult to see how he fits into the system. I think we will see ilson jr on the right side of the midfield diamond. The person that I do not see firing in our new formation is the defensively inept and slow Medunjanin. Out of curiosity how does every think the midfield diamond will look, personal wise? On the left, Creavalle has started all three pre-season games on the left. To me, that says it’s his until someone displaces him (Jones or Fontana). There are still a number of pre-season games left, so there is a little time to experiment now that Fabián is here. Speaking of experimenting, and as “A.” notes above, there has been talk of using two 10’s at times. I wouldn’t be surprised if some of the “forwards” end up at the edges of the diamond. Accam and Picault seem suited to this option. Having two forwards and one #10 with defensively adept wide midfielders doesn’t seem to be enough offense to me. Obviously I could be wrong. Really would like to actually see how they are playing rather than reading some text about it. I could honestly see Fafa playing a wing back spot too. Either way if one of those guys is dropping into the midfield then Medunjanin cannot be on the field too or we will get run over. Ilson does not fit this system at all, unfortunately. He is a winger, and his skill is running at guys one-on-one. There’s no place for that in this setup. He can’t use his fancy feet in the CAM role (we’ve already seen him there and it doesn’t work), he doesn’t have the killer use-of-space instinct to be a forward, and he doesn’t play enough defense to play one of the edges of our diamond. Agree entirely that Medunjanin is also an odd man out here. Don’t forget that his option was picked up before Tanner signed on and changed the system. As for how it will look, 2 spots are locked in, and that’s Fabiàn up top (obvs) and Bedoya on the right (which is a perfect position for him). I would personally love to hand the keys to Derrick Jones and let him become the central midfield destroyer he was (hopefully) destined to be and the back point of that diamond. That leaves the L side, where we may not have an ideal person. But the 2 guys on the roster whom I think might work out best there are Picault — as Dan says, he plays enough defense for that role — or, don’t laugh, Sapong. He also plays enough defense for that role, and he’s actually good and moving the ball along. Taking offensive pressure off him might actually be a good way to utilize him. For what Tanner wants to do our roster still needs a lot of turn over. It seems like there are a decent amount of players that don’t have a spot or are way deep behind other guys in this system. Agree. I wonder if there are still moves to be made within MLS (but it takes two to tango), not to mention a mid-summer splash. I think the only spot we are way deep at is forward. and even there we probably only need to get rid of 1 players (either Sapong or Accam). Otherwise guys fit everywhere. Ilsinho maybe doesn’t, but he’s a supersub anyway at this point which I think he could still fit. Now We probably need to get better overall, but at this point it’s hard to point to an exact position. I think we need another 6 or 8 midfield player. Assuming the depth chart is: 10 -Fabian, Ilsinho, Aaronson. LCM – Warren, Jones. RCM – Bedoya, Fontana. DM – Haris, (either Warren or Jones). We don’t have two players to cover every position. There’s another thing about this contract that is brilliant that is not mentioned in the piece: how it melds the player’s needs with the club’s needs. Fabiàn can’t command the kind of money he’d like from a top league because he’s an injury risk. But his father was quoted as saying that he’d like to get back to Europe as soon as possible — and that’s probably true. So, the guy needs 1-2 years to kick some a$$ and show that he’s back so a European team to show up with a big-money offer. Meanwhile the Union can’t afford to pay a guy for one year at the CAM spot and then be left with nothing, as happened with Dockal’s loan. With the 1+1+1 contract, if Fabiàn does crush it in year 1 and earn himself a major offer from the EPL or the Bundesliga, the Union will have the money to go shopping again — maybe this time for a guy who wants to stay for a few years. If it takes 2 years, the Union should STILL earn themselves a juicy transfer fee. PLUS, the promise of that is likely how Tanner convinced Sugarman to open his wallet: Fabiàn is an investment. Not without risk, of course. But every investment has risk. I am super freakin’ impressed with Ernst Tanner for this. Not just the signing, but the contract.